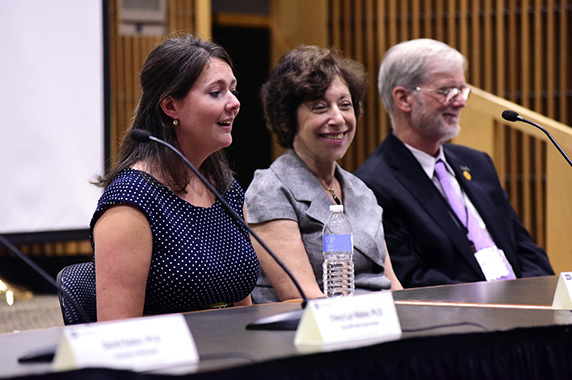 The Society of Toxicology (SOT) celebrated the NIEHS 50th anniversary with a July 13 symposium at NIEHS. 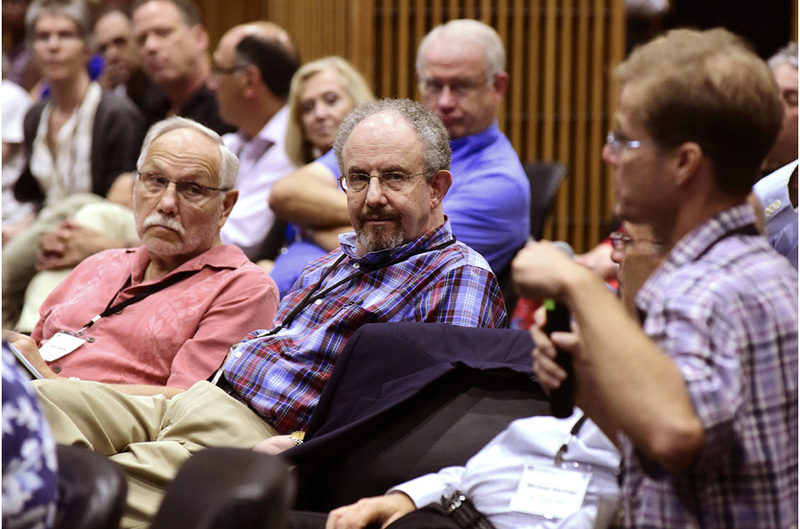 Speakers reflected on decades of collaboration and looked forward to working together to create a safer and healthier world by increasing the impact of the science of toxicology. 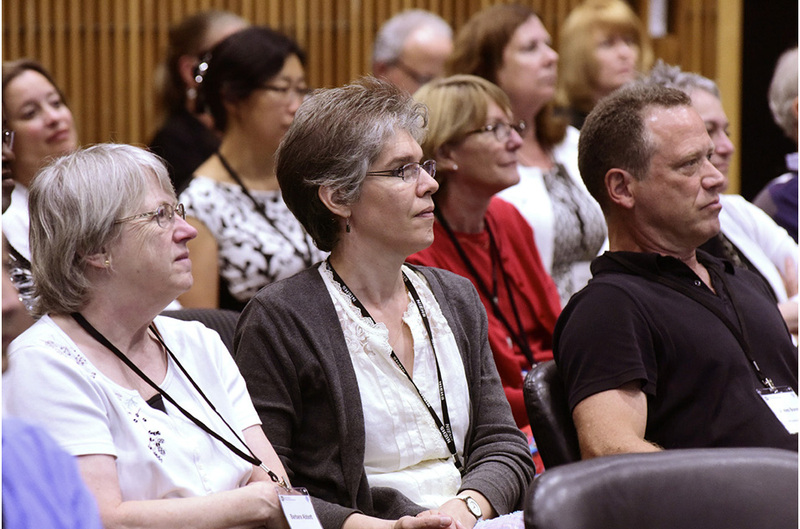 The symposium was followed by an SOT-sponsored reception at which scientists from NIEHS and area universities caught up with society members who were in town for the event. Leaders from the two organizations kicked off the afternoon presentations. Linda Birnbaum, Ph.D., director of NIEHS and the National Toxicology Program (NTP), was introduced by NTP toxicologist Cynthia Rider, Ph.D., chair of the event organizing committee. “[Dr. Birnbaum] is an incredible role model for women in science,” Rider said, noting that Birnbaum was the first female director of NIEHS and NTP, served as SOT Council president in 2004, and has been a member of SOT since 1982. Birnbaum touched on highlights from the 50 years of NIEHS involvement in toxicology. She discussed toxicology research supported through the NIEHS grants and in-house research divisions, in addition to the milestones below. 1978 — NTP was established in the Department of Health, Education, and Welfare, as it was then named. 2004 — NTP issued a roadmap describing its vision for the 21st century, which led to the interagency effort known as Tox21 in 2008. 2016 — The Fourteenth Report on Carcinogens will be released this year. 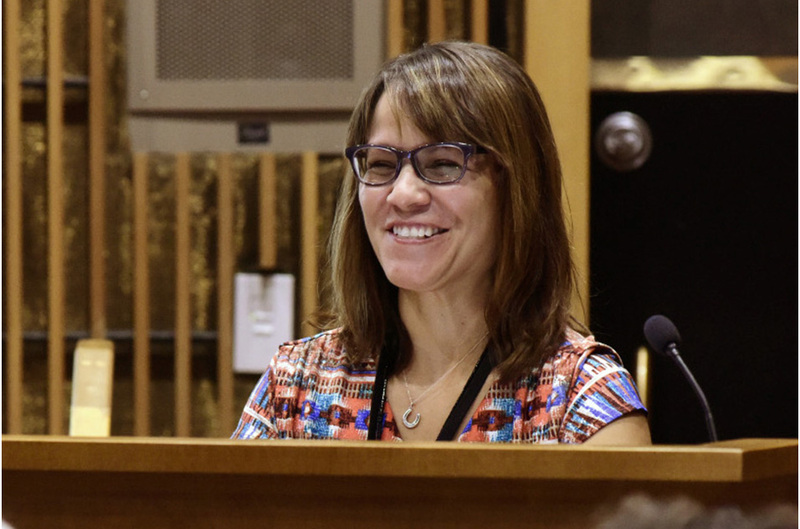 “I’m very proud that we’ve had a number of NIEHSers serve on [SOT] council,” she said, noting that Paul Foster, Ph.D., head of the NTP Toxicology Branch, recently began serving a three-year term. 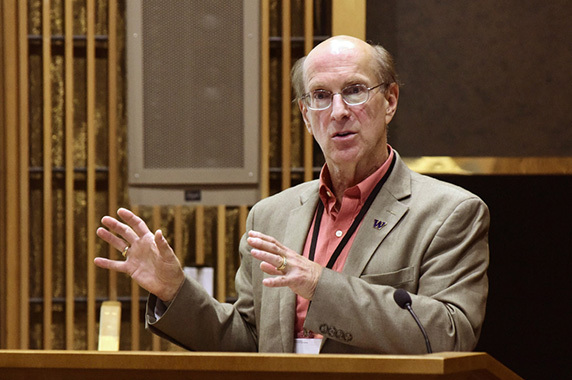 SOT President John Morris, Ph.D., from the University of Connecticut, praised NIEHS training grants. “They are the lifeblood of the future of our field,” he said. 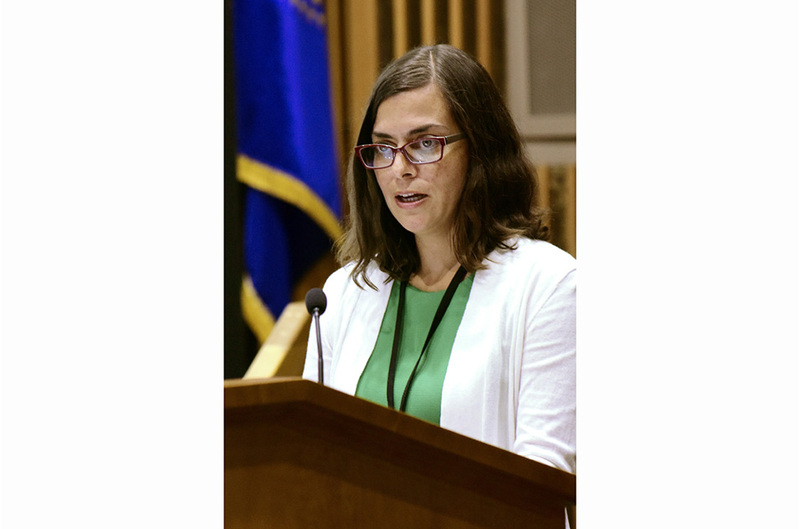 According to Christie Drew, Ph.D., of the NIEHS Program Analysis Branch, nearly one in five current and past councilors and directors of SOT have associations with NIEHS training grant programs. 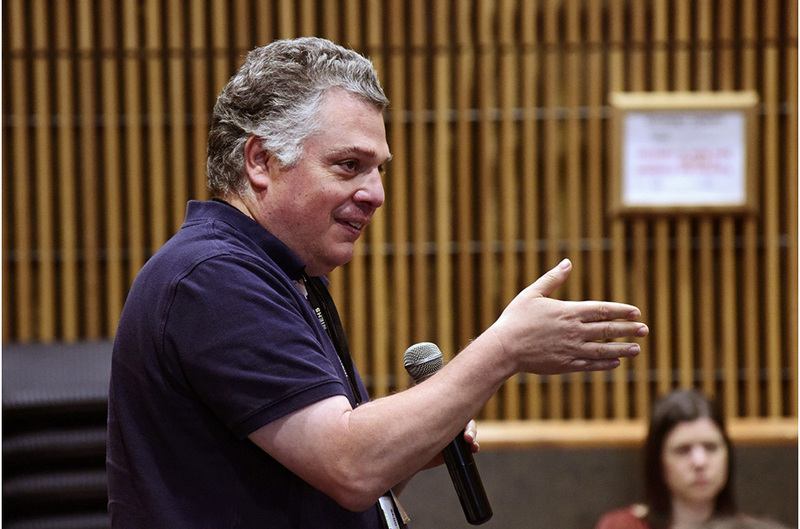 David Eaton, Ph.D., dean and vice provost of the University of Washington Graduate School of Public Health, talked about his early efforts to develop a toxicology curriculum for elementary and high school students. He commended the focus on community outreach and education in NIEHS-funded environmental health core centers and Superfund Research Program centers, as well as resources from the Partnerships for Environmental Public Health program, coordinated by NIEHS program administrator Liam O’Fallon. Eaton thanked NIEHS for the visionary leadership that all of its directors have shown. “Including focusing on prevention — a word that’s hard to find in a lot of NIH [National Institutes of Health] mission statements,” he said. 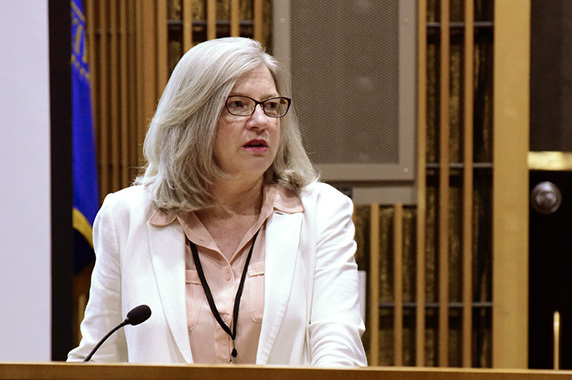 “What a great celebratory day,” said the next speaker, longtime NIEHS grantee Cheryl Walker, Ph.D., who will start a new position at Baylor College of Medicine this year. She described fundamental changes in the NIH system for reviewing toxicology research grant applications, which have proved beneficial. Walker, a key player in that effort, thanked Birnbaum; John Bucher, Ph.D., associate director of NTP; Pat Mastin, Ph.D., deputy director of the NIEHS Division of Extramural Research and Training (DERT); and others for their guidance and perseverance in the process. Kristen Ryan, Ph.D., NTP toxicologist and a key organizer of the event, introduced the final speaker. Phoebe Stapleton, Ph.D., who is transitioning to a tenure-track position at Rutgers University, provided an important look forward, from her perspective as an early career researcher. Stapleton took an unusual route into toxicologic research. Her background in exercise physiology led to an interest in how nanomaterials affect the inner linings of blood vessels and capillaries. 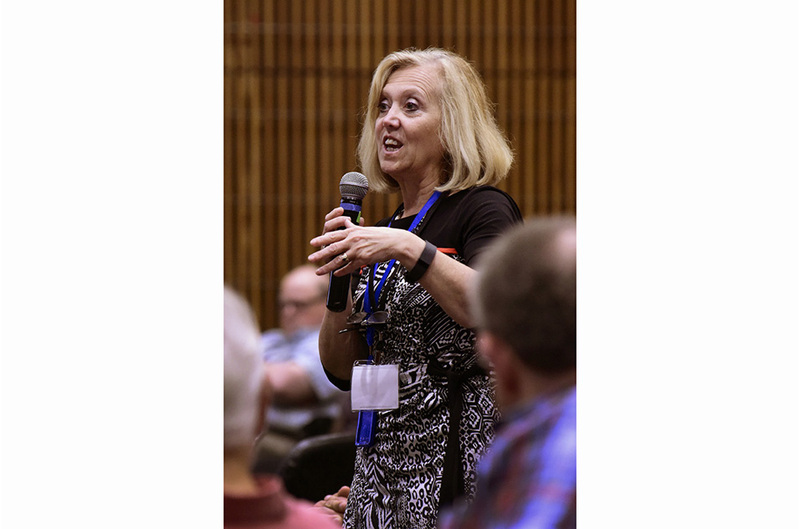 From her first trip to an SOT annual meeting, she said, the group has been crucial to her professional development. “There was a great deal of mentoring and networking,” Stapleton explained. SOT and NIEHS have both helped her identify potential collaborators. “Especially as we talk about resources dwindling, teaming up is going to be one of our best answers,” she said. Following the presentations, Nigel Walker, Ph.D., NTP deputy division director for research, moderated a panel discussion. He kicked it off by asking panelists what advice they would give to scientists starting out in the field. Key points from their answers are below. Stapleton — Know your skills and how to apply them in a variety of contexts, and be persistent. Eaton — Master your presentation skills, because it is important to have confidence and tell a story. Cheryl Walker — Computational biology and bioinformatics are a skill set that is absolutely essential. Birnbaum — Focus on multidisciplinary and transdisciplinary efforts, and on so-called soft skills, such as the ability to work with people and collaborate. Morris — If your manuscripts are not getting rejected, you are not pushing the envelope enough. Submit to so-called stretch journals and welcome the criticism you hear from reviewers. Panelists also stressed the value of joining regional chapters of scientific societies and pursuing collaborations with other researchers involved in them.